In this chapter, as well as in the entire book, unless otherwise stated or implied, by al-Masjid al-Haram it is meant the Ka’bah and its immediate surrounding spaces and areas intended for facilitating the performing of religious rites and services, and by the Ka’bah it is meant only the Ka’bah (Baytullah or the House of God) itself, for such an itemization at present has become a customary and widespread approach, although in theory that is not necessarily always the case. Prior to the epoch of Prophets Ibrahim and Isma’il, there existed only Makkah sanctuary (haram) and the location as well as foundations of the Ka’bah (al-Masjid al-Haram), which had been instituted or appointed for humankind as early as when God created the heavens and the earth. The Qur’an reveals: “Indeed, the first House (of worship) established for mankind was that at Makkah — blessed and a guidance for the worlds” (Alu ‘Imran, 96). The Prophet (pbuh) also confirmed: “Allah made this town (Makkah) sacred on the day He created the earth and the heavens; so it is sacred by the sacredness conferred on it by Allah until the Day of Resurrection…”. As a result, the prophets before Ibrahim and Isma’il and their followers — just like those who came after them — were to face the place (the site of the Ka’bah – and later the Ka’bah itself — its foundations and the haram) in their prayers. When needed or commanded, a form of the pilgrimage (Hajj) to the place, too, was undertaken. After the time of Ibrahim and Isma’il — the builders of the Ka’bah (al-Masjid al-Haram) — and especially during the time of Ignorance (Jahiliyyah) that preceded the prophethood of Muhammad (pbuh), al-Masjid al-Haram was just a small space around the Ka’bah reserved for circumambulation (tawaf). Beyond that space stood people’s houses. The polytheists had no institution of prayer; they had only certain pilgrimage and sacrifice offering rituals. They, in addition, used to sit adjacent to the Ka’bah for their informal conversations. Before the Hijrah (migration from Makkah to Madinah), neither were the Muslims able to perform en masse their prayers in the Mosque due to the constant presence of the polytheists and their readiness to harm them if they did so. The exception was the intermittent, often clandestine, prayers of the Prophet (pbuh), Abu Bakr and a few other Muslims. However, after the conquest or liberation (fath) of Makkah, things completely changed. Apart from circumambulating the Ka’bah, the spaces around the Ka’bah called al-Masjid al-Haram were regularly used for daily prayers as well. But their width which was inherited from the Jahiliyyah period proved sufficient for the Muslim needs too, because the population of Makkah was rather small. Moreover, many people left the city to join the Muslim armies that fanned from the Arabian Peninsula to spread the message of Islam to the world. Theirs was a reaction to the Prophet’s directive: “There is no Hijrah (migration) to Madinah after the take-over or liberation of Makkah; there remained afterwards only jihad (endless struggle for the cause of truth) and niyyah (intending good in all actions)”. But in the course of the relatively long rule of the second rightly-guided Caliph, ‘Umar b. al-Khattab, (13-24 AH/ 634-644 CE) during which both the Persian and Byzantine empires were brought to their knees, the population of Makkah, as well as the number of pilgrims, spectacularly increased. Al-Masjid al-Haram, as a result, became too small to accommodate the swelling needs of the worshippers. ‘Umar thus ordered that the Mosque be widened. He did so in 17 AH/ 638 CE. He bought and demolished houses that stood on the way of the planned extension. The space of the Mosque was increased thereby. ‘Umar even demolished the houses of those people who had refused to sell, even though they were part of the project. He had set aside a price for those houses which their owners later amicably accepted. The Mosque (the space surrounding the Ka’bah) had no demarcating wall before ‘Umar. But as part of his Mosque extension activity, a low wall, less than a man’s height, was built around the Mosque, and torches were placed on it. During ‘Umar’s term, an intense flashflood is reported to have afflicted the city of Makkah including the area of al-Masjid al-Haram. The flood came from the upper part of the city, from a side called al-Mud’a. As a result, maqam Ibrahim (Ibrahim’s station) was displaced from its designated place in the Mosque to a lower part of Makkah. When the water subsided, maqam Ibrahim was found and returned to its place. This particular incident prompted ‘Umar to order the construction of a dam in order to protect the city and its al-Masjid al-Haram from similar calamities in the future. The watercourse was redirected by means of the dam to the valley or watercourse of Ibrahim (Wadi Ibrahim) which is the main valley or watercourse in the whole of Makkah. This way, the subsequent flashfloods were better managed and their devastating impact moderated. After ‘Umar’s death, he was succeeded by Caliph ‘Uthman b. ‘Affan who faced even greater state growth and development challenges than those during ‘Umar’s rule. As a consequence, ‘Uthman also enlarged al-Masjid al-Haram in 26 AH/ 646 CE. He purchased more neighboring houses and enlarged the Mosque by demolishing them. When he wanted to take the houses of those persons who were unwilling to sell, just like ‘Umar, ‘Uthman too put aside the price of their houses, but they came and censured him in the Mosque. He then told them: “Your audacity is the result of my forbearance towards you. ‘Umar did this to you and you affirmed and accepted it.” He then ordered that those persons be imprisoned, but pardoned them shortly afterwards. As part of his Mosque enlargement exercise, ‘Uthman covered a section of the praying area with a simple wooden roof supported by wooden columns, forming a colonnade. The colonnade was erected on the northeastern side of the Ka’bah behind maqam Ibrahim (Ibrahim’s station) because the people used to pray only on that side. They did so, accordingly, in straight lines (sufuf). The remaining three sides of the Ka’bah were empty during prayers. It was only during the caliphate of Umayyad Caliph Abd al-Malik b. Marwan that all four sides of the Ka’bah started to be used for congregational prayers with prayer lines (sufuf) circling the Ka’bah. Such was an invention well received by the people. It follows that as early as during the epoch of al-khulafa’ al-rashidun (rightly-guided Caliphs) some patterns in relation to the incessant and illustrious existence of al-Masjid al-Haram have unmistakably been set. Also, set were some behavioral blueprints at the hands of some of the best of the Prophet’s companions as regards addressing and dealing with the challenges posed by the same phenomenon. Those blueprints, by all means, were very important in that they were laid down by individuals who belonged to the first and finest generation of Islam and Muslims, so much so that their personal opinions and judgments are habitually considered as conditional authoritative sources of the Islamic legislative system (shari’ah) to be looked up at and followed by subsequent Muslim generations. The main aspects of those initial behavioral blueprints are as follows. Once liberated and opened to Islam and Muslims (fath), Makkah with its Ka’bah and al-Masjid al-Haram was set to forever be an object of every Muslim’s spiritual longing and psychological craving. The trend was set to continue relentlessly with the rapid and never-ending expansion of the Islamic state and its community that resulted in large numbers of people to enter the fold of the Islamic message in every subsequent time and place. This, nonetheless, was just an evidence of what had been revealed and portended since time immemorial. It was a divine miracle at work, too. For instance, in the course of their building of the Ka’bah, Prophets Ibrahim and his son Isma’il, also a prophet, supplicated to Almighty God beseeching that He make the hearts among the people (that is, Muslims) incline toward and long for the Ka’bah, al-Masjid al-Haram, the sanctuary and the whole city of Makkah, as well as for all the splendid values and meanings that they were epitomizing (Ibrahim, 37). Moreover, when the Holy Qur’an refers to al-Masjid al-Haram as the first mosque on earth, it also states that it was established or appointed as such for mankind at large, and that it was blessed and a guidance for the worlds and all kinds of beings (Alu ‘Imran, 96). As a perennial source, as well as midpoint, of universal spiritual, intellectual and physical refuge, security, orientation and goodness, al-Masjid al-Haram also stood both as a spiritual and corporeal epicenter of monotheism and a sign of its impending out-and-out triumph over disbelief and polytheism. It was owing to this that upon arriving in Makkah as a liberator (fatih), and while cleansing the Ka’bah and its al-Masjid al-Haram from all its impurities, the Prophet’s motto were the Qur’anic words: “And say: the truth has come and the falsehood has vanished; surely falsehood is a vanishing (thing)” (al-Isra’, 81). Certainly, the constant and dramatic increase of Muslims worldwide, coupled with their ceaseless thronging to the city of Makkah and its Holy Mosque, always entailed scores of serious implications for the ways the city and its Mosque were planned, administered, maintained and, whenever necessary, reconstructed and expanded. Such was the case to the point that the history and development of al-Masjid al-Haram in many ways typified the history and development of Islamic culture and civilization. Because it was an institutional marvel, a structure and an architectural space, moreover, al-Masjid al-Haram likewise embodied and reflected, to a large extent, the history and evolution of the identity of Islamic architecture. Concurrently with the development of al-Masjid al-Haram, Islamic art and architecture were also acquiring their trademark identities, breaking through and ultimately dominating the world cultural and civilizational scenes. It thus can be deduced that the three: al-Masjid al-Haram, Islamic civilization and Islamic architecture, were advancing together, one influencing, and being influenced by, the others. Studying thoroughly any one of them connotes studying a great deal of the other two as well. So integral and inter-reliant were they that irrespective of which one could be the cause and which one the effect, they – and indeed the whole Muslim community (ummah) with them — are bound to rise and wane together. Those people who were both able and most eager to permanently settle closest to the boundaries of al-Masjid al-Haram were the first to be tested by any of the Mosque’s physical expansions. It must have been incredibly hard for such people to come to terms with and accept the looming reality that they had to be relocated and moved farther from the Mosque. So hard was it for some that even substantial financial compensations for their demolished houses and for the sheer act of relocation, together with a great deal of rational persuasion and goodly counsel from nobody else but the leaders of the Islamic community, were insufficient for giving in. There was so much at stake for both parties, so mild force had to be resorted to occasionally at the hands of authorities. This was so because every necessary and justifiable expansion of al-Masjid al-Haram was an occasion where, ultimately, reason had to transcend and preside over emotions, where the interests of society and ummah (the whole Muslim community) had to take precedence over personal, family, tribal and provincial interests, and where terrestrial particulars and relatives should not be allowed to hold back the realization and functioning of heavenly universals and absolutes. What was, and is, always needed for the sake of espousing the wellbeing of all was striking a delicate balance between all the factors, aspects and protagonists that were directly and indirectly involved and affected, never in the process disregarding, much less deviating from the overarching teachings and ideals of Islam. Making some extra sense of the extremely difficult situation some people would find themselves in during every expansion of al-Masjid al-Haram, attempting to moderate it somewhat, one should look at the occurrence a bit metaphorically as well. The expanding Mosque should thus be observed as gradually emerging and coming out to people, warmly welcoming and eventually embracing them and generously treating them to its diversifying and improving facilities, advantages and services. Indeed, whoever comes to al-Masjid al-Haram is regarded as God’s guest; and whoever comes to perform the Hajj (pilgrimage) is regarded as someone who had earnestly answered the call of his Lord, and the Mosque reciprocates, so to speak, the impulse. Hence, if more people come and more frequently so, then more services, facilities and hospitality are correspondingly needed. If al-Masjid al-Haram grows vertically, in the sense that it increasingly receives more spiritually charged visitors, as a result of which more abundant and more congested worship activities are conducted within its parameters, it likewise should increasingly grow horizontally as well, proportionally to the former, so as to establish a perfect physical as well as metaphysical harmony and equilibrium. On that score, having completed building the Ka’bah, Prophet Ibrahim was taught by the angel Jibril the rituals of the Hajj. He was then instructed by God: “And proclaim to the people the Hajj (pilgrimage); they will come to you on foot and on every lean camel; they will come from every distant pass — that they may witness benefits for themselves and mention the name of Allah on known days over what He has provided for them of (sacrificial) animals. So eat of them and feed the miserable and poor. Then let them end their untidiness and fulfill their vows and perform Tawaf (circumambulation) around the ancient House” (al-Hajj, 27-29). According to Ibn Kathir, it was said that Ibrahim said: “O Lord, how can I convey this to people when my voice will not reach them?” It was said: “Call them and We will convey it.” So Ibrahim stood up on the maqam (Ibrahim’s station) — or the mount Safa, the mount Abu Qubays adjacent to Safa, or Hijr (part of the location near the Ka’bah where Ibrahim’s wife Hajar and son Isma’il had lived) — and said: “O mankind! Answer your Lord.” “O mankind! Your Lord has established a House so come on pilgrimage to it.” It is said that the mountains lowered themselves so that his voice would reach all the regions of the earth, and those who were still in their mothers’ wombs and their fathers’ loins would hear the call. The response came from every stone, tree and soil, and from those whom God had decreed will make the pilgrimage, until the Day of Resurrection: “At Your service, O Allah, at Your service”. Therefore, their to some extent justifiable reluctance and dejection notwithstanding, the people most directly affected by any of the al-Masjid al-Haram expansion plans that involved residential relocation activities should also try to generate in themselves a feeling of both gratitude and delight, for a choice fell thereby right on them to be part of a heavenly scheme of some epic proportions. They should try to realize, furthermore, that their beings and their transient properties stand at the center of a higher plan as well as order of infinite meanings and things. Those spiritual sentiments, if properly grasped, are deemed more than sufficient to offset in a person his feelings of temporarily incurred distress and despondency. In fact, a person’s thus physical detachment and distancing from the precincts of al-Masjid al-Haram could easily mean his rapid spiritual drawing closer to it and its multi-tiered spiritual orb. Makkah is an uncultivated and barren valley surrounded by low rocky hill ranges. About it Prophet Ibrahim said in one of his supplications: “Our Lord, I have settled some of my descendants in an uncultivated valley near Your sacred House, our Lord, that they may establish prayer…” (Ibrahim, 37). The city of Makkah features desert climate. Unlike other cities, Makkah retains its hot temperature in winter, which can range from 18 °C (64 °F) at night to 30 °C (86 °F) in the day. Summer temperatures are extremely hot, often being over 40 °C (104 °F) during the day, dropping to 30 °C (86 °F) at night. Since Makkah is located in a low-lying region, it is threatened by seasonal flashfloods despite the low amount of annual precipitation. Westerly winds especially during winter season bring thunderstorms to the city and hailstorms sometimes also occur. In general, humans must live on friendly terms with nature, as much as such an arrangement is possible, beneficial and needed. Under no circumstances can man in any endeavor of his declare a war on the natural environment, because, on account of many a physical, mental and emotional weakness of his and his actual total dependence on the environment, man and nobody else is bound to emerge at all times as a dire loser. The natural environment is simultaneously an obstruction and help, and architects and planners seek both to invite its aid and drive back its assaults. If rightly conceived and seriously pondered, the placements and forms of built environment components in relation to their sites with arrangement of their axes and spaces may well be turned into devices for controlling natural light, ventilation, heating, cooling, insulation, acoustics, etc. Indeed, the most successful urban centers have a mutually rewarding relationship with the environment which builds on the city’s natural advantages and which in turn reduces the burden which the city places on its surroundings. Thus, it goes without saying that, just as was the case with all traditional and organic cities in the past, the physical conditions of Makkah, such as its climate, topography and natural environment, always had a notable influence on the plan and morphology of the city. The shape of the city was directly related to the land conditions and its physiography. The built-up area and the expansion of the city were restricted to the narrow valleys which divided the steep mountains and hills. This also directed the transportation routes, their direction and size. While houses in many places of Makkah were built along the existing valleys, many other houses were constructed on the lower hills. There were also houses on the upper sides of hills and mountains. Whereas in the latter two cases accessibility and movement were the main concerns, in the former, however, the hazard of occasional cloudbursts followed by flashfloods loomed large. Accordingly, because al-Masjid al-Haram and its adjoining residential areas occupied the core of Makkah, and through their diversified and dynamic functions, personified the city’s total meaning, spirit and character, they, without doubt more than any other segments and components of the city, needed to embody and reflect the notions of sustainable, climate-conscious and nature as well as user-friendly built environment all the way through. As a matter of fact, additionally, the whole of Makkah as a holy place needs constantly to be an inspiration, an embodiment and source of all goodness for everyone from all the worlds. This is especially so in such a critical realm as built environment due to its capacity as a framework and physical locus of human life, as well as an identity of a people and a microcosm of their civilizational consciousness and achievements. When originally built by Prophets Ibrahim and Isma’il, the Ka’bah was an unpretentious stone structure. No mud was used either for bricks or as plaster for coating the walls. Since it was roofless and its two entrances had no doors, neither was timber needed. The stone over which Ibrahim stood and built is called maqam Ibrahim (Ibrahim’s station). It is still in existence today and is revered by all Muslims. Even some religious rituals are directly associated with it. Ibrahim is said to have built the Ka’bah using building materials from five special earthly mounts: Hira’ in Makkah, Tur Sina’ in the Sinai Peninsula of Egypt, Tur Zayta’ in Palestine, Jabal Lubnan in Lebanon and al-Judiyy which is a mount at which Prophet Nuh’s ark came to rest after the great flood, demonstrating thereby its universal character and appeal, as well as penchant for bringing together and reconciling between people of different backgrounds and dispositions. The place thus was a catalyst of peace and security; it was an eternal beacon of human hope and optimism. Based on the historic significance of those mountains and hills, some of whose parts had been integrated into the form and configuration of the Ka’bah, the Ka’bah could also be regarded as a symbol and microcosm of entire human history. It should be seen as an epitome of perpetual human struggle, human civilizational challenges and victories. According to Abdullah Yusuf Ali, historically al-Masjid al-Haram remained the center to which all the Arab tribes resorted for trade, poetic contest and worship. It was a sacred territory, and was respected by friend and foe alike. At all seasons, all fighting was forbidden within its limits, and even arms were not allowed to be carried, and no game or other thing was allowed to be killed. Makkah was recognized by Arab custom as inviolable for the pursuit of revenge or violence. That the Ka’bah – Baytullah or the House of God — was originally built as an unpretentious stone structure in a physical context characterized as uncultivated and barren valley surrounded by rocky hill ranges, was extremely apt, making it appropriate to its time, place and people. The Ka’bah was in total harmony with its natural environment. It grew, as it were, out of the site. It at once symbolized and reverberated Makkah’s attribute as haram (blessed sanctuary). In consequence, it always seemed naturally beautiful, hence sustainable and even organic, satisfying physical and spiritual needs. It exuded an aura of veneration, lure, awe and spiritual and psychological serenity. Due to all this, plus the supplication of Ibrahim that the believing human hearts incline towards it, the Ka’bah was always dearly loved and longed for. Because it is a result of a direct heavenly initiative and involvement, the Ka’bah’s intrinsic charm and beauty were always beyond description. Lost for words, while watching, touching or circumambulating it, most people tend to give in to the stream of abundant but incommunicable spiritual, psychological and even intellectual emotions the circumstances generate. As if they all sense that being silent and self-effacing, acknowledging the supernatural and divine overarching character of the Ka’bah (al-Masjid al-Haram), while juxtaposing it with their flaws, inadequacies and this-worldliness, is the best and most profitable mood. Any other approach is set to divest visitors and worshippers of some of the boons they have come for and were instinctively looking forward to procuring. Feeling thus hopeless, some people resort to closing their eyes and try to “watch” and “embrace” the Ka’bah rather by means of their elated hearts and ecstatic souls. That way, all the inapt and under the circumstances “impairing” physical senses are temporarily shut, and through that metaphysical God-granted capacity that graces each and every human creature, one’s self is attempted to be elevated to a higher spiritual vantage point from where the Ka’bah could be “seen” and experienced better. Such is also an attempt intended to identify and equate one’s ontological meaning and purpose with the ontological meaning and purpose of the Ka’bah and al-Masjid al-Haram. Losing completely one’s self inside the infinite spiritual domains of the Ka’bah and al-Masjid al-Haram, it goes without saying, is the best way for a person to find and experience the quintessence of his own being, existence as a whole and the Ka’bah phenomenon itself. So, therefore, when Caliph ‘Umar b. al-Khattab constructed a dam and thus redirected one of the most critical watercourses that run through Makkah, in order to protect the city and its Ka’bah and al-Masjid al-Haram from the peril of future calamitous flashfloods; when he erected, not a monumental and disconnecting, but a low and rather symbolic wall, less than a man’s height, around the Mosque and placed torches on it for illuminating the place at night; and, finally, when Caliph ‘Uthman b. ‘Affan covered a section of the praying area with a wooden roof supported by wooden columns, forming a colonnade; it shows that from the very beginning, al-Masjid al-Haram and its leading protagonists were within their means and given situations and contexts very sensitive and responsive to the requirements of what is called today sustainable, environment and user-friendly architecture. The way al-Masjid al-Haram was planned and constructed, and from what building materials, implies that it was a simple, yet healthful and close to both people and nature site and structure. It was conscious of its cost, functionality and comfort. Though it existed in a particular historical moment and geographical space, emanating and rising out of them, it was highly flexible, adaptable and open-ended, satisfying the fast growing social, physical and spiritual needs of the people of the day. Al-Masjid al-Haram also embraced and embodied the human spirit, transcending the mere act of a mosque and a place of fixed worship rituals into something which shaped and enhanced individuals’ and communities’ lives, for mosques are built by people and for people with the aim of functioning as their community development centers. Since it is an Islamic tenet that the whole earth has been created as pure and a mosque, and that all animate and inanimate beings thereon – except a company of humans — incessantly and in unison worship, glorify and sing praises to Almighty God, the Creator, Sustainer and Lord of the universe, al-Masjid al-Haram, while serving as a nucleus of and a center of gravity in the spiritual predilection and unceasing experiences and occurrences of the whole earth, ought each time to be planned and designed, firstly, as an organism suitable for its immediate surroundings, and secondly, especially in terms of its projected spiritual and civilizational purpose and functionality, as an entity with an all-encompassing and global character, mission and appeal. As such, the Ka’bah and al-Masjid al-Haram are to control and dominate the city of Makkah’s landscape and skyline, just as they influence and dominate people’s hearts and minds. They should not be dominated, overshadowed or subdued, neither physically by a built environment trend or style, nor by a vision or an ideology which the former might exemplify. It could be owing to this that the word ka’bah linguistically, among other things, means “cube or square house or structure” which in turn is derived from the noun ka’b and verb ka’aaba meaning “cube” and “shaping something like a cube” respectively. In addition to the idea of a cube-like building, the Ka’bah is so called also because of it being a high and elevated structure. It likewise means a place of honor, dignity and distinction. 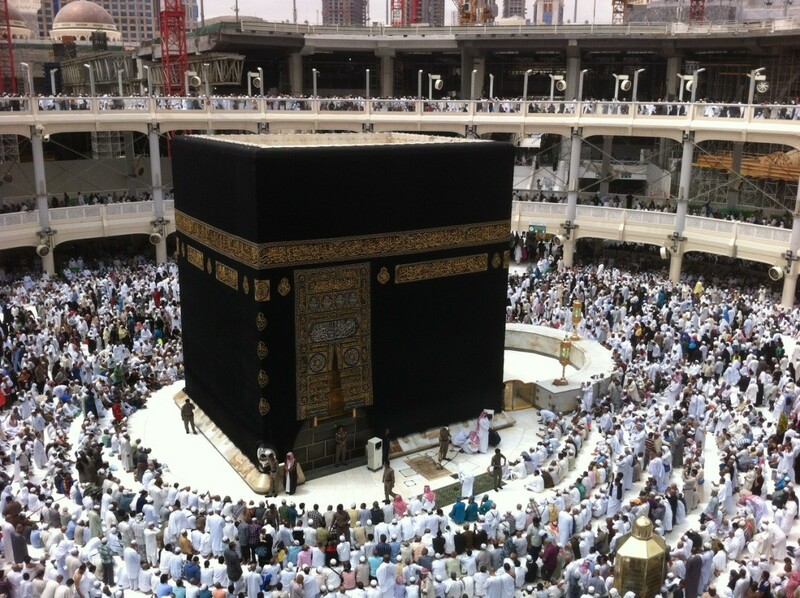 Its status as a high and elevated edifice is derived from the verb ka’aba which means to swell and grow full. For example, the ankle (ka’b) is so named because it protrudes, or rises, from the leg. In the Arabic language, anything that visibly protrudes from a main body, or a mass, and stands high in a round or any other regular shape, could be called ka’b. Correspondingly, the first thing that was established and built in Makkah was the Ka’bah (al-Masjid al-Haram). Hence, by applying two fundamental principles of Islamic built environment — i.e., a hadith (Prophet Muhammad’s tradition) that there should be neither harming (darar) nor reciprocating of harm (dirar), and right of precedence, according to which an earlier party’s rights in a built environment context ought to be respected and under no circumstances violated by a subsequent party which builds later – the aforementioned viewpoints could also be substantially corroborated. The Ka’bah – Baytullah or the House of God, whose site, plan, form and function God Himself has chosen for a reason – and with it al-Masjid al-Haram, it stands to reason, are to serve as a benchmark for the quintessence of Islamic built environment in every time and place. Muslims therefore should never stop learning and bringing to light the Mosque’s inexhaustible meanings and secrets, striving then to apply them in different sectors of their existence, above all in the ambit of built environment.